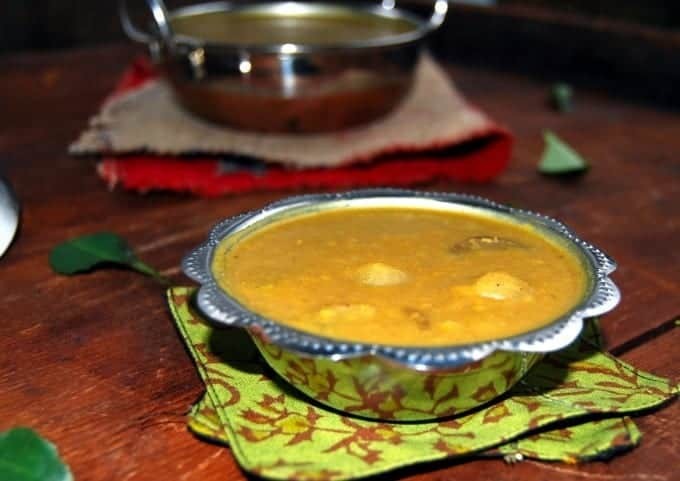 Vengaya Sambar is a south Indian onion dal, made with pearl onions and lentils. A fragrant spice mix infuses the dal with flavor. Serve with rice. 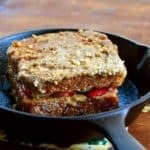 A gluten-free, soy-free and nut-free recipe. It’s almost a given that you cannot go to a Tamil home without being invited to stay for a meal. 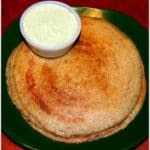 Tamilians love to feed as much as they love to eat, and when we go to Chennai on our visits back to India it is not unusual for us to have two lunches, two dinners, and umpteen snacks, all in a single day, as we make the rounds of our relatives’ homes. When we lived in Bombay, we were not above exploiting all this hospitality. The mother of one of our friends, Malathy, was a great cook. Luckily our home was not far from Malathy’s, and whenever we were craving a great homecooked Tamil meal Desi and I would just drop in for a visit, sure that we’d be well fed. While almost any meal you’d eat in a Tamil home would be special, we were never happier than when we were served Vengaya Sambar or Onion Sambar, a delicious dal made with tiny red onions. This dish, one of Desi’s favorites, fast became one of my favorites too because it is just so delicious. 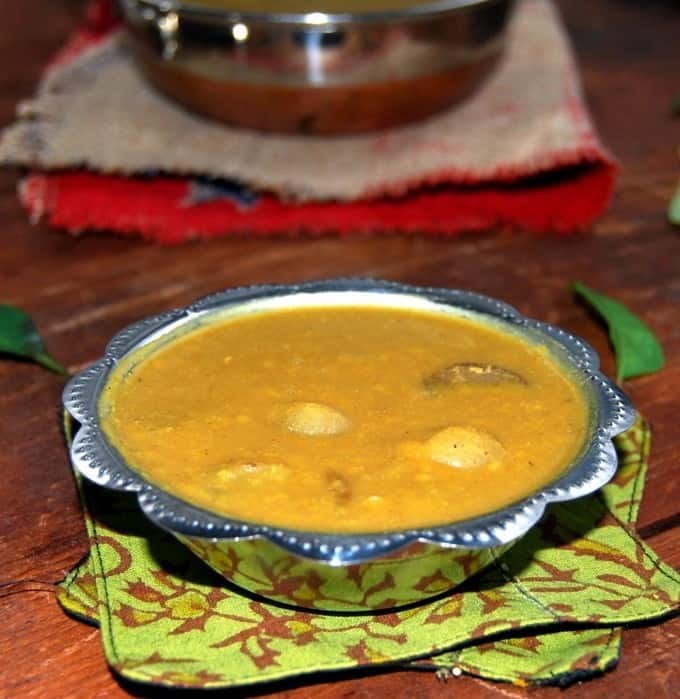 It was also one of the first types of sambar I learned to cook when I started to putter around the kitchen. Many years — and hundreds of sambars later– I want to share with you this classic dish beloved in every home kitchen in Chennai. 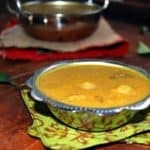 My version is made with fresh ground sambar masala that takes just minutes to put together. 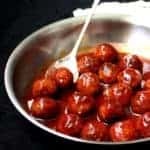 The red pearl onions (chinna vengayam in Tamil) are key to this dish because of their unique flavor. If you can’t easily find them in your grocery store don’t be tempted to substitute with the more commonly available white pearl onions because you just won’t get the same flavor. Red pearl onions are sold both fresh or frozen at Indian grocery stores and buy the fresh ones if possible because while the frozen onions are lower on labor (you don’t have to peel them), they can sometimes be chewy. If you absolutely cannot find red pearl onions, I’d advise buying shallots instead and cutting them into small pieces. Vengaya Sambar tastes best poured over some hot boiled rice with a side of crispy potato curry. And don’t forget to toast up some poppadums! 1 tbsp of tamarind extract mixed with 1 cup of water. Alternately if you're using tamarind pods, soak a 1-inch ball of the pods in warm water for 15 minutes, then extract the flavor by crushing the pods with your fingers. Discard the solids and reserve the liquid portion. 2 cups red pearl onions, ends trimmed and papery skins peeled. Tamil cooks sometimes soak the onions overnight which makes it easier to slip the skins off. Mix the lentils and turmeric, add water and cook until tender in a pressure cooker. Or cover the peas with an inch of water in a pot and bring to a boil, then slap on a lid, lower to simmer, and boil for 30-45 minutes or until the peas are tender enough to mash. Add more water if needed as they cook. Prepare the ground masala by heating 1 tsp of oil. Add to it the coriander seeds, chana dal, fenugreek seeds and chillies and saute until the coriander seeds and dal turn a few shades darker and are lightly golden-brown. Remove to a blender, add enough water to keep the blades moving, and process to a smooth paste. Heat 1 tsp of the oil, add the pearl onions and stir-fry until the start to turn golden. Add the tamarind extract and let the mixture cook about 8 minutes. Add the ground masala and stir well to mix. Add the cooked tuvar dal and bring everything to a boil. Lower the heat to a simmer, add salt to taste, and let the sambar cook for 10 minutes so all the flavors have a chance to meld together. 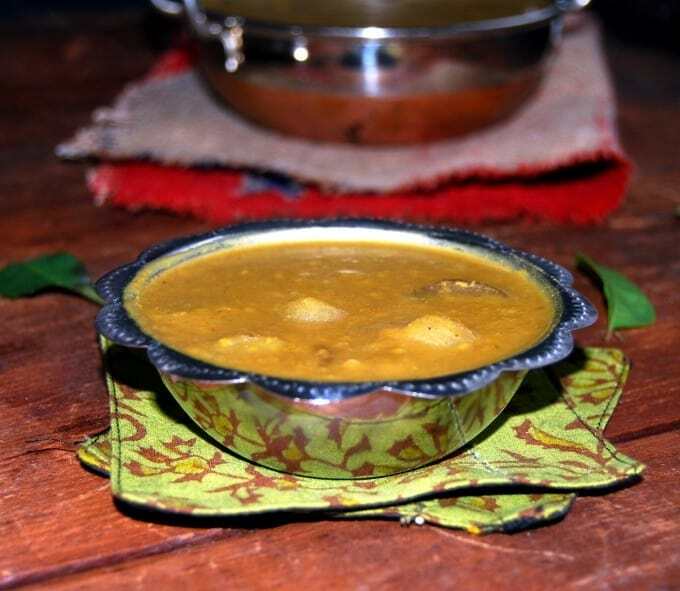 To temper the sambar-- an important flavor-building step-- heat the last teaspoon of oil in a small saucepan and add the mustard seeds. When they crackle, add the asafetida and curry leaves. Fry for a few seconds, turn off the heat, and pour over the sambar. Mix well. I had a school and later college friend who lived close by (Tamil) and our group would regularly drop by, to hog (which is polite, if u saw how we crammed) the super delicious food her mom made. I find peeling the tiny onions such a fiddly job, but I will take that any day over using the frozen, peeled Madras onion. I used them once with unacceptable results, never again! Is the proportion of sambar masala for single use? Hi Manasi, yes, it’s for single use. I like using lots of coriander seeds in case you wondered about that– they really enhance flavor and are particularly good in sambar. The food prepared by the Tamil people will be delicious… especially the sambar which they call the kolam I guess. Sorry if I am wrong. The onion sambar which you have told gives an awesome taste with the small onions which we get in market. I am put up in Bangalore and will be doing this recipe often. I get a very good quality small onions from http://qusec.in/vegetables-and-fruits/potato-onion-and-tomato/ and this one tastes awesome. 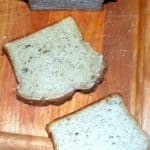 Thanks for making many people know about such good and simple recipe. 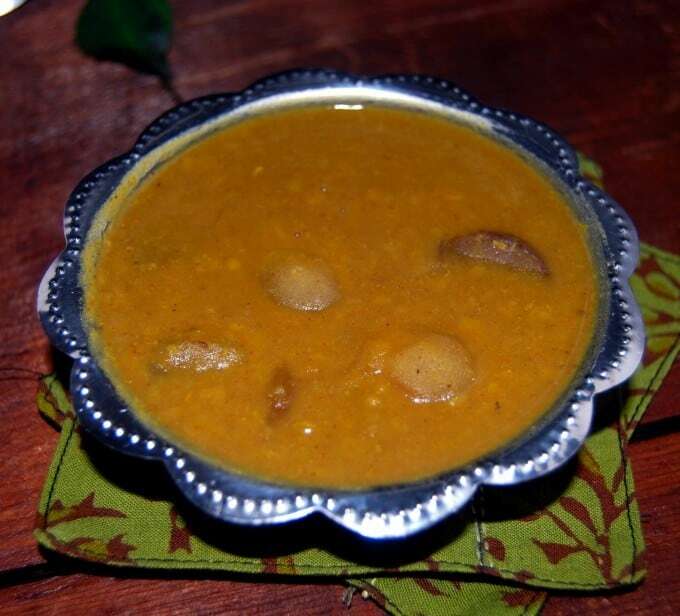 Hi Nidhi, Sambar is indeed delicious– another name for it is kuzhambu. Glad to meet a reader from Bangalore– such a lovely city! Thanks for sharing the link. I have to have tons of onion in my sambar, and I love using pearl onions. The flavor is just so awesome! Looks delicious! Poornima, Thanks, and yes, the flavor of red pearl onions is quite unlike any other. Any tips for peeling the onions besides soaking in water? I’ve tried it just once, but it still took me forever (or it seemed like it) to peel the tiny onions. I am ok with time consuming tasks, but this just wasn’t easy. Hi ET, there is no easy way I know of – it just is a labor intensive job. 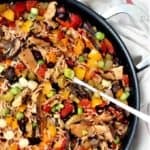 To save time I would say just use shallots because their flavor is perfect for this dish. You won’t have the cute little onions in there but your sambar will taste fantastic.